alaTest har samlet og analyseret 35 anmeldelser fra magasiner og hjemmesider. Folk kan virkelig godt lide pålideligheden. Gennemsnitligt vurderede brugere dette produkt til 75/100 og eksperter vurderede dette produkt 84/100. The contradictions we found in the Acer B326HK prove that while 4K monitors are the wave of the future, the present has its imperfections. While not a bad monitor on the whole, the Acer B326HK ymjdpphz has too many deficiencies to be worth the price it’s selling for. There are now better options on the market and they deliver more value per dollar spent. 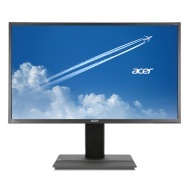 El Acer B326HK es un monitor profesional de 32 pulgadas con panel IPS y una excelente resolución 4K, que multiplica por cuatro el nivel de detalle de un panel Full HD. Der Acer B326HK stellt mit seiner UHD-Auflösung viermal so viele Bildinformationen dar wie ein Full-HD-Display. Gedacht ist er für den Office-Einsatz, zur Bildbearbeitung sowie für CAD-Anwendungen. So far I love this monitor.